Bring the Boulangerie (French Bakery) into your home! 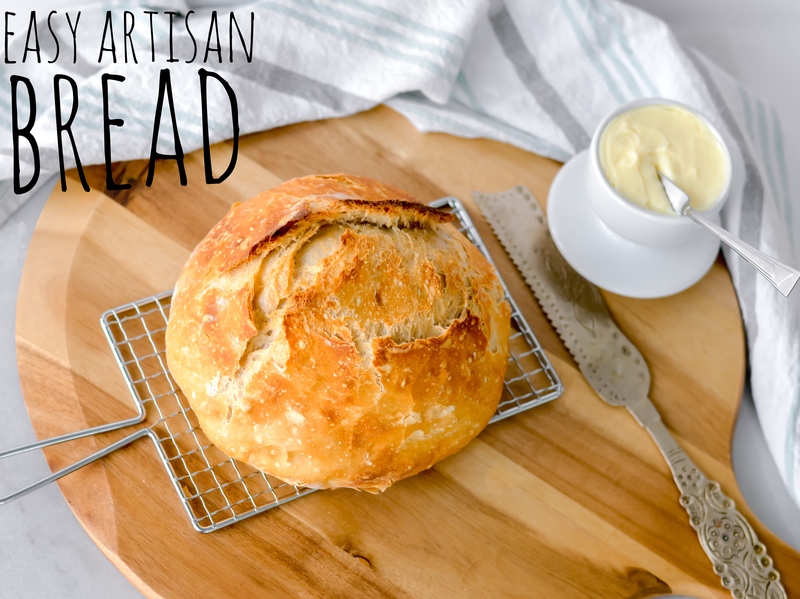 YOU can make this easy artisan bread in just a few minutes with four simple ingredients. 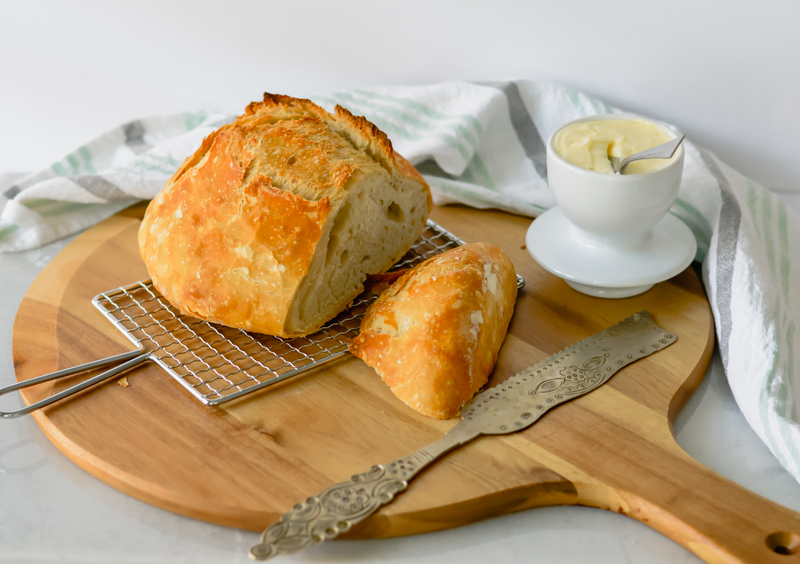 Is there anything better than fresh bread right from the oven? This crusty loaf with its soft, chewy interior requires no kneading and is sure to become a favorite. I’ll bet you have everything you need already, so let’s get started! It’s sooooo easy! Place flour, salt and yeast in a mixing bowl. Gradually add the water, stir until mixed well. Mix dough gently until it forms a rough ball. Transfer dough to a large clean, un-greased, mixing bowl. Cover with plastic wrap and let dough rise at room temperature until surface of dough is covered with tiny bubbles and the dough has more than doubled in size. 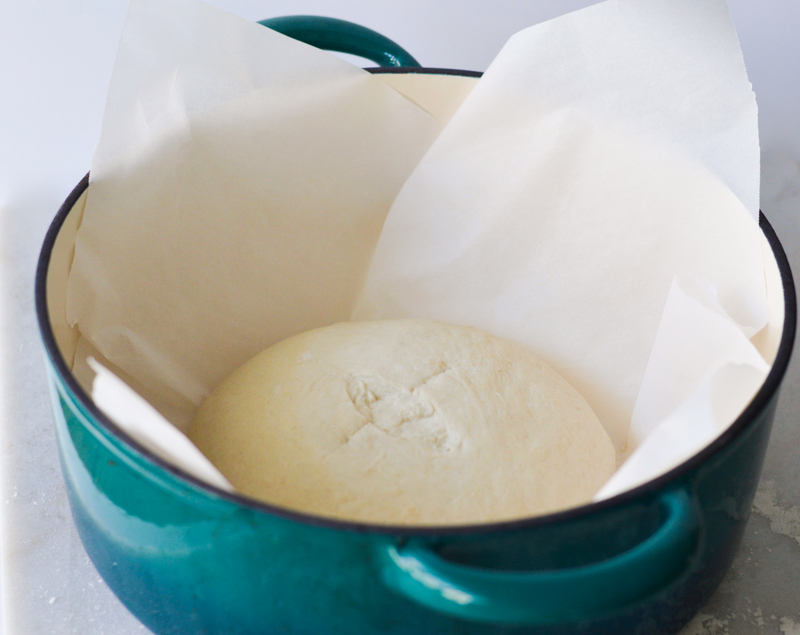 For best results, let dough rise 18 – 24 hours. Before baking, place an empty Dutch oven, with its lid, into the oven and turn it on to 450 degrees. Allow it to heat in the oven for 30 minutes. Remove dough from bowl and place on a well-floured surface. Create a smooth ball by pulling corners of dough underneath until the surface is smooth. Carefully remove Dutch oven from the oven. Remove lid, then lift corners of parchment paper and lower dough into hot pan. Replace lid and return to the oven. Bake 30 minutes. Remove lid and bake additional 10 minutes or until the top is browned. Remove from oven and place bread on a cooling rack. Allow it to cool for at least 30 minutes before slicing. 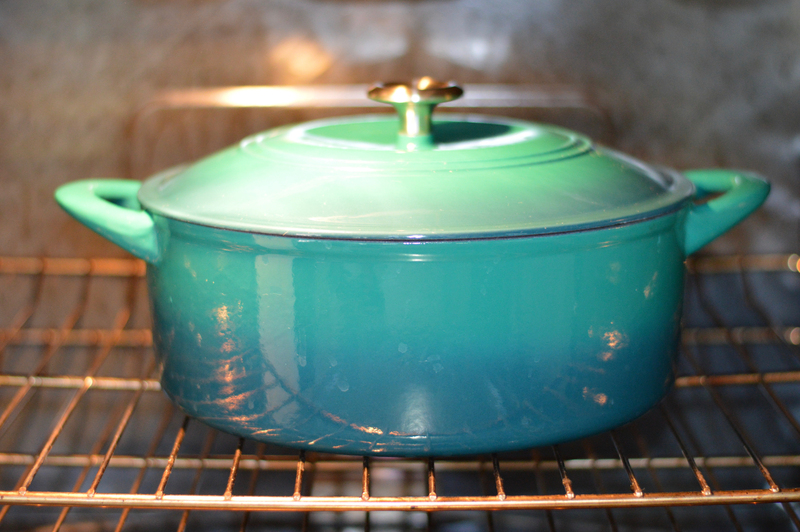 If you don’t have a Dutch Oven, you can use the insert of a crock-pot (and the lid) or any deep enameled stoneware you might have, just cover it with foil. You will love this bread! Your friends and family will love it. And you’ll feel like a boulonger! Place flour, salt and yeast in a mixing bowl. Gradually add the water, stir until mixed well. Mix dough gently until it forms a rough ball. 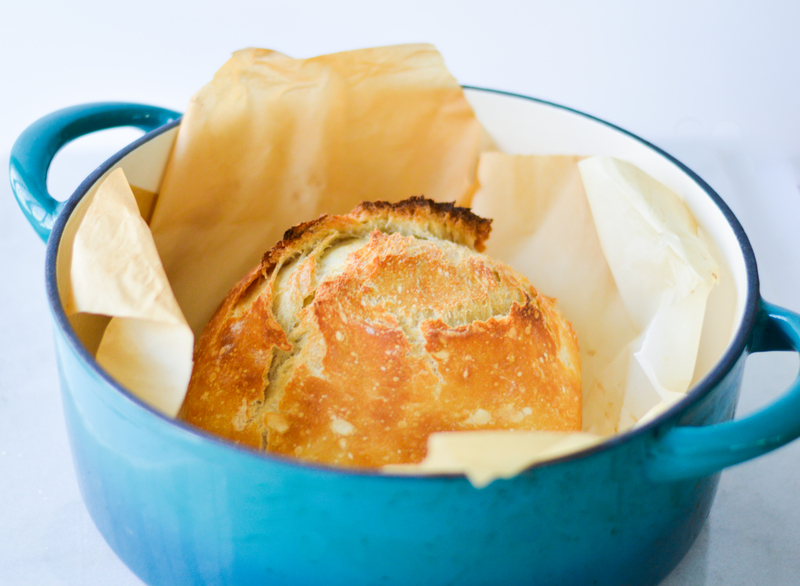 Before baking, place an empty Dutch oven, with its lid, into the oven and turn it on to 450 degrees. Allow it to heat in the oven for 30 minutes. Place dough on a square of parchment paper big enough to cover bottom of the Dutch oven. Dust dough with flour, cover it with plastic wrap and let it rest 10-15 minutes. Carefully remove Dutch oven from the oven. Remove lid, then lift corners of parchment paper and lower dough into hot pan. Replace lid and return to the oven. Bake 30 minutes. Remove lid and bake additional 10 minutes or until the top is browned. Looks SO yummy! Is there a way to bake this if you don’t have a Dutch oven? Yes! Take the ceramic pot out of your crock pot and line it with foil. Don’t use the glass lid of your crock pot, cover the dough with foil, just don’t cover it tightly you’ll want to leave room for the bread to rise and grow as it bakes! Is it worth trying if I only have about 5-6 hours for it to rise? Or should I wait and plan to do it for a different meal?